She was built in Hamburg by Blohm and Voss for the firm of F. Laeisz for the Nitrate trade with Chile. 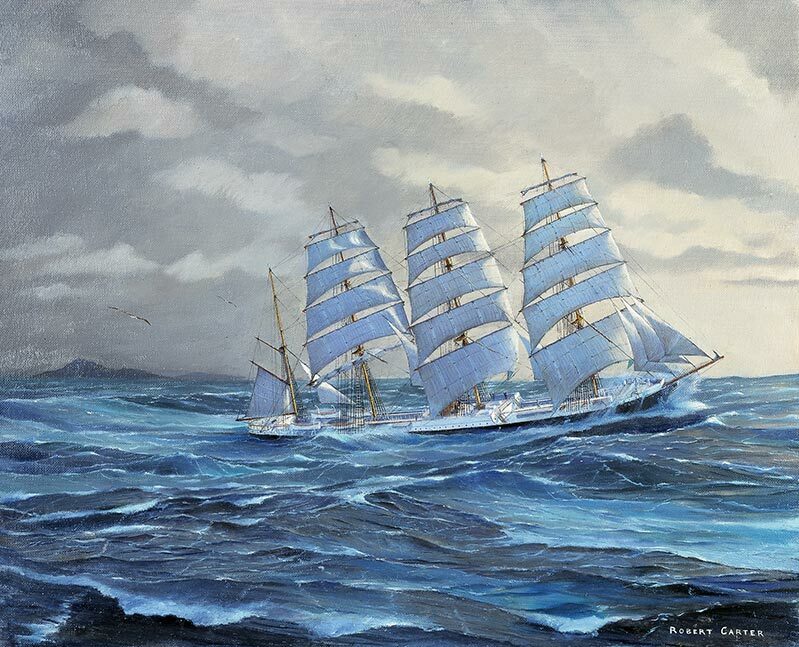 In 1931 she was sold to Finnish shipowner, Gustaf Erikson, who was the world’s last operator of sailing ships. In 1941 she arrived at Wellington New Zealand and was seized as a war prize. Under the New Zealand flag she traded throughout the war across the Pacific to the USA and Canada; made a voyage to Sydney in 1947 and to the UK in 1948. In 1949 she was returned to Finnish ownership and sailed to Pt. Victoria, South Australia, where she loaded grain along with the 4-masted barque Passat – their destination, UK. Pamir departed on 29 May, Passat on 1 June. 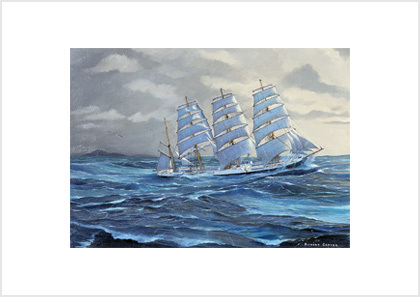 Passat rounded Cape Horn on 9 July and Pamir 2 days later. These were the last ever commercial voyages that would be made by engineless sailing ships. A certain amount of licence has been taken with this painting. Keith McKoy, a seaman in her crew, told me that the actual rounding took place in darkness but at dawn the sky assumed a strange yellow hue as depicted here. Pamir and Passat were purchased by a German syndicate and later made voyages to the east coast of South America as auxiliary training ships. Pamir’s tragic end came in 1957 when she was overwhelmed by a hurricane in the Atlantic. 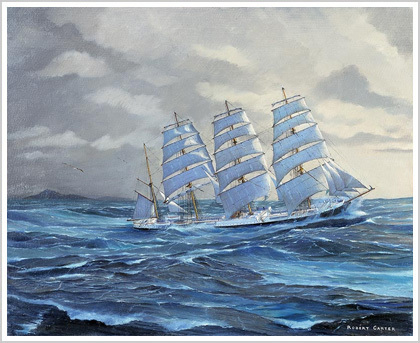 Karl Otto Dummer, one of the six survivors, gave me a graphic account of her capsizing and their subsequent rescue which appears in my book Windjammers – The Final Story. Passat was withdrawn from service and is still afloat as an exhibition ship in Travemunde, Germany.